Only the best quality - premium eLiquids from Germany. So delicious das Soda-lishes Ice Liquid by Momo Soda Liquids! Herb Grapefruit, sweet raspberry and juicy plum on ice chilled lemonade. Banana!!!!! The classic cheesecake combined with the fruity banana and a fine vanilla note makes the one banana liquid from magnes E-Juice unique. An e liquid is the liquid used with an e cigarette. It produces the delicious vapor that is inhaled when heated. Different to cigarettes vaping causes no harmful substances. But that’s not the only advantage vaping has over smoking. You can choose so many sumptuous flavors that it’s nearly impossible to try all. The variety gets even bigger if you combine them. All our liquids are available with the nicotine level of your choice as well as nicotine free. If you have a sweet tooth and like extravagant sugary flavors try our sweet or special liquids. If you are more into freshness you will love fruity and menthol flavored liquids. Lovers of tangy aromatic tastes will fall for our tobacco and nut liquids. No matter what you pick we offer you only high quality products that we would vape, too. Our Colt Arctic Liquid has been made to keep you cool. The icy cold of the Arctic meets the intense freshness of peppermint and spicy menthol. Feel refreshed! Lovers of strong, full-bodied tobacco will fall for our Max Blend Liquid, a well-balanced, spicy and complex tobacco blend that provides stunning vape taste. 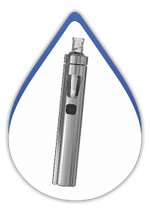 What does an e-liquid consist of? All liquids by my-eLiquid are 100% made in Germany. The liquid consists of a base, a flavoring of your choice plus nicotine in varying levels if you wish so. 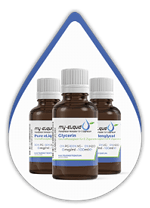 The base itself contains propylene glycol (PG) and vegetable glycerin (VG) plus distilled water. Very few people are allergic to PG. In this case polyethylene glycol 400 (PEG) can be used instead of PG. All named substances are according to the German pharmacopoeia. The PG: VG ratio defines not only the liquid’s sweetness but also the density of the cloud you produce while vaping. The flavors you choose are also used in food industry. 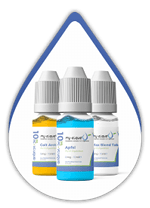 All liquids are offered from nicotine free to a nicotine level up to 18mg/ ml. Gosh, there are so many advantages vaping has over smoking. Did you know that vaping causes no damage to the lung cells? Well, smoking does. And that’s how cancer can develop. Numerous studies have shown that vaping is less harmful than smoking. After you switch from normal cigarettes to e-cigs your hands, hair and clothes will no longer have that typical lingering bad smell. In fact, vaping has a clean and soft scent everyone will love. You will feel more energetic and by quitting smoking you will stop ruining your complexion by early aging. Your sense of smell and taste will return to normal. As if this wasn’t enough, vaping can actually safe money. So what are you waiting for? Make the switch today! Which nicotine level is right for me? The nicotine content depends on your habits. If you are about to switch from smoking to vaping we recommend to maintain the same nicotine level. All indicated nicotine levels refer to mg per ml. Heavy smokers who smoke up to two packs per day often take 18mg/ml. If you have smoked about 15 cigs a day you can choose 12mg/ml. For the social smokers 6mg/ml or less is suitable if you wish to have nicotine in your e-liquids. Surely you can reduce the level step by step to withdraw completely from nicotine. You are a non-smoker? Make sure to buy nicotine free products so that addiction has no chance to develop. All indications refer to milliliter.